"Mesmerizing and magical. . . . A stunning book." --NPR.org "Short stories so imaginative -- and yet so perplexingly familiar -- they could have formed in a dream. . . . Taut, meticulously balanced and written in Loory's direct, witty prose, his own stories take a page from Aesop: high-flying tales nonetheless boiled down to the essentials." --The Los Angeles Times "Ben Loory's stories are little gifts, strange and moving and wonderfully human. I devoured this book in one sitting." --Ransom Riggs, author of Miss Peregrine's Home for Peculiar Children A dazzling new collection of stories from the critically acclaimed author of Stories for Nighttime and Some for The Day Ben Loory returns with a second collection of timeless tales, inviting us to enter his worlds of whimsical fantasy, deep empathy, and playful humor, in the signature voice that drew readers to his highly praised first collection. In stories that eschew literary realism, Loory's characters demonstrate richly imagined and surprising perspectives, whether they be dragons or swordsmen, star-crossed lovers or long-lost twins, restaurateurs dreaming of Paris or cephalopods fixated on space travel. In propulsive language that brilliantly showcases Loory's vast imagination, Tales of Falling and Flying expands our understanding of how fiction can work and is sure to cement his reputation as one of the most innovative short-story writers working today. "The stories in Tales of Falling and Flying are mesmerizing and magical, and Loory has a boundless imagination. He's also a deeply compassionate author - the world he's envisioned with this book is one that rewards kindness and inclusivity. It's a stunning book that's perfect for oddballs, outcasts or, really, anyone who wants to escape to another, better world, if only for a few hours." "Short stories so imaginative - and yet so perplexingly familiar - they could have formed in a dream. . . . Taut, meticulously balanced and written in Loory's direct, witty prose, his own stories take a page from Aesop: high-flying tales nonetheless boiled down to the essentials." "Frequently comical and dark, often heartwarming, nearly always fantastical, and consistently entertaining. Some [are] haunting in their portrayals of human cruelty; others make you see the joys of imagination anew, like 'The Monster,' in which a boy and the monster in his closet 'sit . . . all afternoon, giving names to the world.' . . . Loory [acknowledges] how integral emotion is to his work. As he sees it, a story will not be good if the reader is not affected by it. . . . By that measure, and by almost any other, these stories are a success." "The stories in Loory's new collection swerve at the reader in unexpected ways. . . . Some of these stories turn on reversals of fortune; others use time-honored narrative tricks to reach unlikely epiphanies. But for all of the weirdness present here-strange histories, altered spaces, talking animals-there's also a sense of sincerity. Loory isn't winking when he presents questions of love or loneliness; he's aiming at a very particular sense of timelessness and agelessness. . . . These are stories that seem familiar yet, at their best, feel fresh-it's a winning sense of deja vu." "Tales of Falling and Flying consists of 40 extremely short pieces of fiction that, in Alice in Wonderland fashion, turn the mundane into the extraordinary. Tales of President James K. Polk, spiders, astronauts, islands, dodos, and zombies ponder the fundamentals of human existence through the fantastically absurd. Each story nugget is quick to read but pricks the mind long after." "[Loory's] stories feature an array of genres, characters, and creatures, but are never defined by any of them. They are short stories, so short that it sometimes feels like you've taken one as a vitamin instead of opening up a book. . . . Many of [Loory's stories]-'Lana Onion' being my favorite-are more slice of life with a tinge of surrealism, as if you tasked David Lynch to rewrite three random sentences in a Raymond Carver story." "[N]othing short of extraordinary. If Aesop's Fables had a three-way with The Grimm Brothers Fairytales and The Twilight Zone and then gave birth to a book, it would look a lot like Ben Loory's latest release. . . . [D]elightfully funny, thought provoking and entertaining writing which is the hallmark of Loory's unconventional-yet-conversational style. . . . [Loory's] masterful understanding of what it takes to make a sentence sing in a witty, winsome and deep way is just one more reason that this collection of short stories is one you'll want to binge on over and over again." "Los Angeles author Ben Loory delivers another marvelous collection of strange, sweet, surreal fables in Tales of Falling and Flying. An amorous squid, a dodo with an identity crisis, aliens, zombies and characters named War and Peace make lasting impressions." "The stories in Tales of Falling and Flying are mesmerizing and magical, and Loory has a boundless imagination. He's also a deeply compassionate author -- the world he's envisioned with this book is one that rewards kindness and inclusivity. It's a stunning book that's perfect for oddballs, outcasts or, really, anyone who wants to escape to another, better world, if only for a few hours." --Michael Schaub, npr.org "Short stories so imaginative -- and yet so perplexingly familiar -- they could have formed in a dream. . . . Taut, meticulously balanced and written in Loory's direct, witty prose, his own stories take a page from Aesop: high-flying tales nonetheless boiled down to the essentials." "Frequently comical and dark, often heartwarming, nearly always fantastical, and consistently entertaining. Some [are] haunting in their portrayals of human cruelty; others make you see the joys of imagination anew, like 'The Monster, ' in which a boy and the monster in his closet 'sit . . . all afternoon, giving names to the world.' . . . Loory [acknowledges] how integral emotion is to his work. As he sees it, a story will not be good if the reader is not affected by it. . . . By that measure, and by almost any other, these stories are a success." "The stories in Loory's new collection swerve at the reader in unexpected ways. . . . Some of these stories turn on reversals of fortune; others use time-honored narrative tricks to reach unlikely epiphanies. But for all of the weirdness present here--strange histories, altered spaces, talking animals--there's also a sense of sincerity. Loory isn't winking when he presents questions of love or loneliness; he's aiming at a very particular sense of timelessness and agelessness. . . . These are stories that seem familiar yet, at their best, feel fresh--it's a winning sense of deja vu." --Tobias Carroll, Tor.com "Tales of Falling and Flying consists of 40 extremely short pieces of fiction that, in Alice in Wonderland fashion, turn the mundane into the extraordinary. Tales of President James K. Polk, spiders, astronauts, islands, dodos, and zombies ponder the fundamentals of human existence through the fantastically absurd. Each story nugget is quick to read but pricks the mind long after." --John Ottinger III, World Magazine "[Loory's] stories feature an array of genres, characters, and creatures, but are never defined by any of them. They are short stories, so short that it sometimes feels like you've taken one as a vitamin instead of opening up a book. . . . Many of [Loory's stories]--'Lana Onion' being my favorite--are more slice of life with a tinge of surrealism, as if you tasked David Lynch to rewrite three random sentences in a Raymond Carver story." --Matt E. Lewis, Vol. 1 Brooklyn "[N]othing short of extraordinary. If Aesop's Fables had a three-way with The Grimm Brothers Fairytales and The Twilight Zone and then gave birth to a book, it would look a lot like Ben Loory's latest release. . . . [D]elightfully funny, thought provoking and entertaining writing which is the hallmark of Loory's unconventional-yet-conversational style. . . . [Loory's] masterful understanding of what it takes to make a sentence sing in a witty, winsome and deep way is just one more reason that this collection of short stories is one you'll want to binge on over and over again." --Cynthia Romanowski, Orange County Register "[O]ne of the strangest books I've read all year. . . . Imagine a Magritte painting mixed with The Twilight Zone. It's a comfortable kind of weirdness that's accessible yet thought-provoking. Though the stories are generally no longer than three or four pages, they operate on a metaphorical level. Though none of us have met a talking duck, we all know someone who's fallen in love with the wrong person. Loory's stories are like being on a carnival ride right at that moment when whimsy gives way to something else, a vertiginous feeling that takes hold and then, just as quickly, slips away." --Jim Ruland, San Diego CityBeat "If you loved Ben Loory's first short story collection, Stories for Nighttime and Some for the Day, you'll love his second even more. 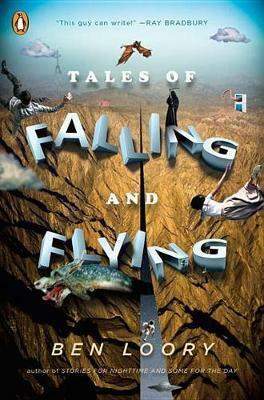 Tales of Falling and Flying takes readers to wonderfully whimsical worlds where anything is possible." --Hello Giggles "Exquisitely crafted fables. . . . A perfect follow-up to his starred debut. . . . Sometimes there's anthropomorphism in stories that recall David Sedaris' Squirrel Seeks Chipmunk. . . . He hits just the right beat at the right moment. . . . Delightfully disarming stories for readers seeking a plunge down the rabbit hole." --Kirkus Reviews (starred review) "Life and death are treated with equal gravity and levity in this nimble, refreshing collection of shorts from Loory. Each of these stories is a deceptively small bite, its depth of flavor often growing and lingering. . . . The book engages both the profound and the frivolous. Reality flirts with and sometimes gives way to the bizarre, the economy and style of language making a man with disappearing body parts ('Missing') and a sloth seeking work in the city ('The Sloth') equally vivid." --Publishers Weekly "Ben Loory's stories are little gifts, strange and moving and wonderfully human. I devoured this book in one sitting." --Ransom Riggs, author of Miss Peregrine's Home for Peculiar Children "Russell Edson's new protégé, or Steven Millhauser, distilled into tea. Meet, or re-meet, Ben Loory, whose preposterous, friendly stories can't help but charm. They are so bizarrely readable they don't even feel like they're made of words." --Aimee Bender, author of The Particular Sadness of Lemon Cake "Ben Loory is a wonder. I'd like to curl up inside his marvelous head and canoodle with a besotted squid, swallow a tiny dragon, levitate with Death, and fall in love with the Eiffel Tower, and after reading these sublime stories--slyly funny, melancholy, and deeply weird--I suppose I have, and it was fantastic." --Elissa Schappell, author of Blueprints for Building Better Girls "Who the hell is this guy? What happened to make this brain? These are the questions you'll ask after Ben Loory's Tales of Falling and Flying. Loory is the psychedelic Aesop of our modern age, the king of talking birds and frogs, characters named war and peace, the Apuleius of the internet generation. His words are full of swords and wings. Get ready. They'll cut you. They'll make you fly." --Scott McClanahan, author of The Sarah Book "To read a Ben Loory story is to slip through a portal into an adjacent dimension. To learn--with brevity and clarity--the laws of this universe next door, new rules of logic and contradiction and truth. And, in the end, to be left with the disturbing and wondrous feeling of having never left home at all." --Charles Yu, author of How to Live Safely in a Science Fictional Universe "These tiny off-kilter fairy tales, equal parts Beckett and Twilight Zone, will amply suit surrealistic seniors and twisted teens alike. Perfect for reading on strange beaches and by oddly-shaped swimming pools. Fits right in your pocket or purse for emergency doses of the charming and weird." --Janet Fitch, author of White Oleander "Parables, dark fables, quirky flash fictions--call them what you will, Ben Loory has perfected the form and in Tales of Falling and Flying proves once again he can disturb a little and entertain a lot. Easily read, not easily forgotten." --Jeff VanderMeer, author of The Southern Reach Trilogy "Ben Loory's stories are like perfect kōans cracked from inside the world's smartest fortune cookie; funny, crunchy, and irresistible." --Mark Haskell Smith, author of Naked at Lunch "One of my favorite writers, Ben Loory is almost impossible to describe. Like Bruno Schulz, if Schulz had been born to a left-handed Little League coach in Short Hills, New Jersey? Like Lydia Davis, if she'd been hatched from an egg? Like listening to a conversation between Bette Davis and Miles Davis outside the house where Amy Winehouse died? Like listening to Mick and Keef not talk about Altamont? Probably there is a war going on somewhere, but these cool, dazzling little tales will never let on." --Peter Straub, author of A Dark Matter "This darn book is like receiving a sword in the mail or finding a maze in the kitchen or a squid who fell in love with the sun or a dragon in the backyard; it's confusing at first and then the next thing happens." Ben Loory is the author of the collection Stories for Nighttime and Some for the Day and a picture book for children, The Baseball Player and the Walrus. His stories have appeared in The New Yorker, Tin House, READ Magazine, and Fairy Tale Review; been heard on This American Life and Selected Shorts; performed live at WordTheatre in Los Angeles and London; and translated into many languages, including Japanese, Farsi, Arabic, and Indonesian. A graduate of Harvard and the American Film Institute, Loory lives in Los Angeles, where he is an Instructor for the UCLA Extension Writers' Program.